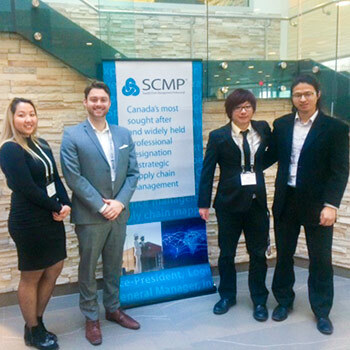 A student team from Wilfrid Laurier University's Lazaridis School of Business and Economics put what they learned in the classroom to the test – solving real-world supply chain management problems to win the 2018 nationwide Supply Chain Management Association (SCMA) of Canada Student Case Competition. The Lazaridis School team, made up of fourth-year students Justin Fu, Cody Petrosino, Serena Truong, and Mike Zhou, was one of five teams chosen from 28 teams across Canada to compete in the final round of the SCMA Case Competition, held simultaneously at three institutions nationwide on Feb. 24. This is the third year that the Lazaridis School has participated in the case competition, where student teams solve a real-world challenge by applying a supply chain case solution with elements of logistics, network design, procurement, relationship-management and sustainability. A panel of business professionals and academics judge the teams on their case solution, presentation and originality. To begin the competition, the team prepared a case and completed a 20-minute presentation in the regional round, competing against teams from Ontario universities and colleges. After producing a winning presentation and case solution, the team was given four hours to prepare for their 10-minute presentation in the final round, competing against universities from across Canada. "The team executed almost flawlessly in the final round," says Michael Haughton, case coach and professor of supply chain management at the Lazaridis School. "It gave me such pride to watch them place first." When Haughton first asked his class who would like to compete in this year's SCMA Student Case Competition, Petrosino, Truong, and Zhou jumped at the chance to represent the Lazaridis School. The trio then recruited Fu, who had collaborated with them before. All of the team members are students in the Bachelor of Business Administration program. Petrosino, Truong, and Zhou are enrolled in the supply chain management concentration of the program, while Fu is in the accounting concentration. This cross-disciplinary approach served them well. To achieve the top prize, the team worked tirelessly through a rigorous preparation process on top of their normal course workload. The students presented two practice cases prior to the competition – given only hours to prepare for each. The team's coaching team, Haughton; Shailendra Jha, associate professor and director of the Lazaridis School's Centre for Supply-Chain Management; and three Waterloo Region industry executives, Keith Lue, Mike Quartermain and Agostino Zucco, judged the team's practice cases. "Our coaching team provided us with invaluable feedback that we integrated into our approach, allowing us to be successful at the competition," says Petrosino. The team also carved out hours during reading week to prepare. The group was dedicated and set on bringing their best. "We likely spent over 37 hours working to prepare for the competition," says Petrosino. "It was an honour and privilege to represent the Lazaridis School." "Industry and academic partnerships like this competition are so crucial for both parties," says Haughton. "As academics, we want to make sure our work – in research and training – is anchored in reality. At the same time, we have research findings we can contribute to the industry. There's tremendous value in this type of partnership." Cases, where students work in small teams to solve a real-world business problem, are an important part of the teaching and learning experience at the Lazaridis School. "Cases are reality. They serve as experience that students can take with them to their first job interview as a new grad. It gives them the edge they need to succeed in the real world," says Haughton.